Since September 2004, MERI operates a continuous water monitoring network in the lower Hackensack River. Currently, three locations are monitored for water quality of the estuary 24/7. This network enables the Authority to continuously monitor and detect any adverse effects of the surrounding District landfills and land uses on water quality on real-time. Every hour, stations at each location measure: dissolved oxygen, water elevation, acidity, electrical conductivity, turbidity (the amount of particles suspended in the water), salinity and temperature. The information is transmitted on an hourly basis via cellular phone connection to the MERI lab where results are inspected for suspicious values and are updated on the Internet in “near real time”. 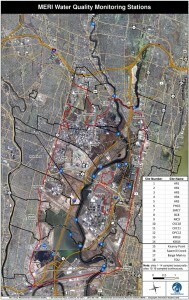 The Master Plan adopted by the NJMC in January 2004 included goals for cleaner water and air. 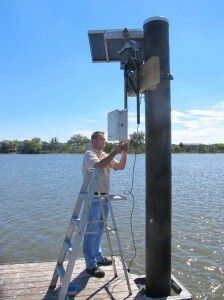 Data collected by this network helps create a report card on the water quality of the lower Hackensack River. Go to MERI Vista Data Vision to see the “near real time data”. Please see the map for the station locations.